Front page › Latest news › Blog › Fighting for better financing for education – on the Southern streets or in the Northern corridors of power? Fighting for better financing for education – on the Southern streets or in the Northern corridors of power? FCA supports primary schools in the Bidibid refugee settlement area. 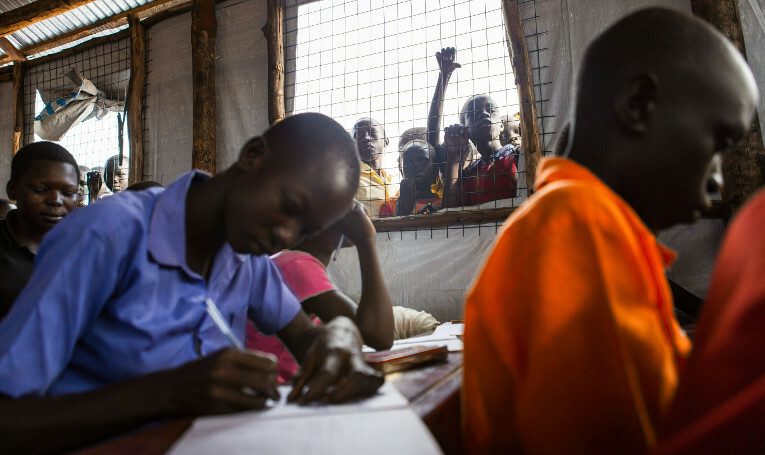 More than 60 percent of South Sudanese refugees arriving in Uganda are under 18 years old. How is advocacy best done for financing of education and the SDG goal 4, especially in situations of emergency and conflict? Is good advocacy about gathering evidence and data, and then meeting influential people with fat check-books? Or is it better to be out on the streets, mobilising grass-roots and sharing stories of injustice? When you have a bunch of very feisty civil society campaigners from across the Arab world and Eastern European countries meeting the regional networks in Africa, Asia, and Latin-America in Beirut for a few days, as happened last week, then the answer is a bit of both. The Arab Campaign for Education for All, together with UNESCO and the Open Society Foundation, had invited representatives of both national coalitions and education ministries of Somalia, Lebanon, Palestine, Tunisia, Iraq, Sudan, Yemen, and Jordan to meet with their colleagues from Albania, Moldova and Georgia, as well as the coordinators from the regional networks and representatives from the Global Partnership for Education (GPE), Education Cannot Wait (ECW), the Inter-agency Network for Education in Emergencies (INEE), Education International (EI), the Right to Education Initiative (RTE) and others. For an organisation like FCA, whose work focuses on linking education to earning opportunities for young people and to peace, the question regarding how to best use our advocacy efforts to secure funding are fundamental. FCA works in several of the countries that were present in the meeting. We are closely involved in advocacy for better funding for development at the global level, especially for emergencies and fragile countries. As such, we try to influence decisions taken by national governments and funding initiatives like the ECW and GPE, either as a single agency, or through ACT Alliance, or via the very close relationship we have with INEE. However, in a conference that is full of activists, a question that rises for FCA and for INEE as well, is how much should we align ourselves with the street-fighters, for whom every struggle is political and ideological? Whose agenda often springs from very strong social movements in Africa and Latin America, closely linked to teacher unions and other left-leaning organisations, and who work hard to mobilise youth through empowerment and inclusion? Or should we instead focus on the ‘movers and shakers’ in New York and Brussels, the influential people, who can sway large funding streams and direct them the right way to ensure that as many as possible get their fair share of the cake? But who, on the other hand, also sometimes represent governments and organisations that promote their own interest, and for whom international development is just a source of business and of winning elections. There are similar fundamental questions considering which funding streams we should be looking at and trying to influence. More than 95 % of all funding to education – in time of peace – comes from domestic sources, not from international aid. Perhaps this means that New York is not the right place to do advocacy; that instead we need to dress up in our jeans and hoodies and support local civil society, and demand that local governments use much more of their budget on education (and less on military), and try to push for tax reforms that make multinationals and the rich pay their fair share. In emergencies, this figure of 95 % goes down drastically, as often the government disappears and there are no taxes. People are on the move, and education systems become reliant on coordination from the outside and on international funding streams, directed from New York, Brussels and Geneva. Therefore we must travel to these places, put on our dark suits and enter the corridors of power, to speak on behalf of local civil society and young learners denied an education. Whatever the approach we choose – and of course it is always a bit of both! – the meeting produced a very strong sense of a shared responsibility for us all to stand up – either in front of influential people or out on the streets – and to demand that financing for education in emergencies must be quick, meaning available to be disbursed immediately; long-term, meaning disbursed predictably over multiple years; flexible and allocated to non-formal as well as formal solutions; equitable, meaning that it should be spread evenly across all emergencies and intended to reach all children; and lastly additional, in order to not displace other aid and support, but instead to be directed to new and necessary evidence based interventions. Should pay a fair SHARE! Anything less than 20 percent. And force them to pay much more tax. Invest in civil society SCRUTINY. With sensitivity, scrutiny, share and size. That education budgets need four S’s.